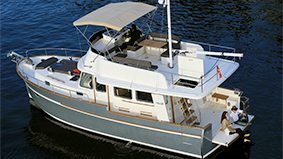 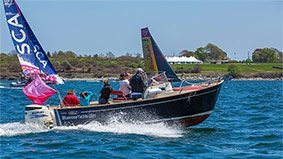 With her elegant hull, her classic rounded, tumblehome stern and flared bow, the Rhea 27 Escapade is equally as well suited to day sailing as to short cruises thanks to her cabin equipped with two berths, a galley and a marine toilet. 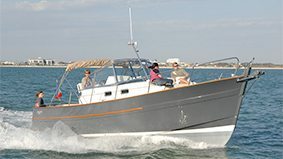 The safe, pleasant and comfortable motor yacht has reassuringly high bulwarks and seaworthiness. 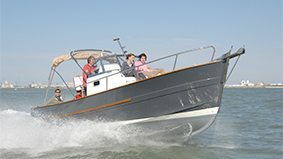 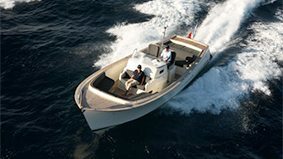 The central, protective steering console accommodates two adults whereas the stainless steel handrail around the windscreen and pilot seating add to on-board safety and her elegant appearance. 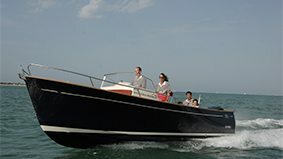 There are numerous storage lockers and two folding benches which convert the aft cockpit into a spacious dining area for lunch with family and friends, whilst the forward sunbed will be appreciated for relaxing. 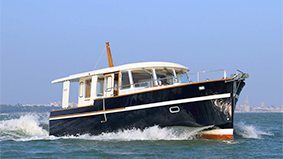 She has been carefully and thoughtfully constructed, making her a particularly elegant motor yacht.